The effects for Organic Carbon was less warming (mean of 0.132) and for Black Carbon was slight cooling (mean of -0.044). This is for the instantaneous removal of all anthropogenic aerosols, which won't happen (less than half of aerosols are now coming from utilities and industries). And it doesn't include the responses from natural aerosols which may increase as a result of climate change. So while the reduction of anthropogenic aerosols due to a decrease in fossil fuel burning may result in a slight increase in temperature, it probably will be far less than the 2 to 4 degrees I keep seeing people post in the ASI forums. The recent studies I posted about upthread show much smaller impacts, less than 1 degree C. Are you confusing the overall warming impacts (including polar amplification due to warm water transport to the Arctic and changing air currents) from increased greenhouse gas concentrations with the increase due to reduced aerosols? If so, you're double counting the impacts, as these studies are using GCMs that take into account these effects. Earlier papers that project aerosol forcing have real problems since many (most!) of the ESM models did not include key (known) atmospheric and atmospheric chemistry interactions with aerosols. These models underestimate the aerosol effect. This has been well known even before the publication of AR5 as satellite observations indicated much greater effects than were being modeled. This total indirect effect is comprised of First (FIE) and Second (SIE) indirect effects, both are negative (cooling). The lack of these mechanisms in some models and the poor representation (compared to direct observations in others) led to the great uncertainty bars in the AR4 and AR5 (image below) for this effect. The total indirect effect here is labeled "Cloud Adjustments due to Aerosols" with a median value of about 0.56 Watts/m^2. One‐unit enhancement in aerosol scattering coefficient by swelling effect is found to lead to a systematic underestimation of the first indirect effect (FIE) by about 23% that can result in an underestimation in the FIE‐related radiative forcing by several W/m2 depending on aerosol properties and relative humidity. Using preindustrial emissions models, the change in Nd between preindustrial and present day is estimated. Nd is inferred to have more than tripled in some regions. Cloud properties from Moderate Resolution Imaging Spectroradiometer (MODIS) are used to estimate the radiative forcing due to this change in Nd. The Twomey (FIE) effect operating in isolation is estimated to create a radiative forcing of -0.97 ± 0.23 W m^2 relative to the preindustrial era. We note that in two models, Arctic warming due to aerosol reductions reaches 4°C in some locations (Figures S2–S5). The four‐model mean increase for the 60°N–90°N region is 2.8°C. It is strongly urged that you limit your research for best accuracy to papers less than 2 years old since the modeling capabilities have increased significantly since 2015. I understand that this has produced a lot of confusion in the discussion since the understanding of these aerosol impacts are changing very rapidly. WRT CESM as a model for aerosol response. Those are all good papers, based on recent modelling. There are other good papers based on recent modelling that show the aerosol -cloud interactions may be over estimated. Aerosols have a potentially large effect on climate, particularly through their interactions with clouds, but the magnitude of this effect is highly uncertain. Large volcanic eruptions produce sulfur dioxide, which in turn produces aerosols; these eruptions thus represent a natural experiment through which to quantify aerosol–cloud interactions. Here we show that the massive 2014–2015 fissure eruption in Holuhraun, Iceland, reduced the size of liquid cloud droplets—consistent with expectations—but had no discernible effect on other cloud properties. The reduction in droplet size led to cloud brightening and global-mean radiative forcing of around −0.2 watts per square metre for September to October 2014. Changes in cloud amount or cloud liquid water path, however, were undetectable, indicating that these indirect effects, and cloud systems in general, are well buffered against aerosol changes. This result will reduce uncertainties in future climate projections, because we are now able to reject results from climate models with an excessive liquid-water-path response. September-October which equates to a global annual mean effective radiative forcing of -0.035 ± 0.013 W.m-2 (1 standard deviation) assuming that a forcing only occurs in September and October 2014. Global emissions of anthropogenic SO2 currently total around 100 TgSO2/year and the Intergovernmental Panel on Climate Change17,47 suggests a best estimate for the aerosol forcing of -0.9 W.m-2 , yielding a forcing efficiency of -0.009 W.m-2 318 /TgSO2. The emissions for September and October 2014 total approximately 4 TgSO2, thus the global annual mean radiative forcing efficiency for the 2014-15 eruption at Holuhraun yields a forcing efficiency of -0.0088 ± 0.0024 W.m-2 320 /TgSO2 (1 standard deviation). The similarity is remarkable, but may be by chance given the modelled sensitivity to emission location and time (Supplementary S12). In other words, the constraint fits if it involves a far nothern hemisphere loading and the fall period, the effect is greatly exacerbated during both summer and in regions with higher relative humidity (i.e. the tropics). Changes in cloud amount or cloud liquid water path, however, were undetectable, indicating that these indirect effects, and cloud systems in general, are well buffered against aerosol changes. This result will reduce uncertainties in future climate projections, because we are now able to reject results from climate models with an excessive liquid-water-path response. The first scale is energetic: the ERFaci is approximately two orders of magnitude smaller than the shortwave cloud radiative effect (e.g., ). The path to a 1% effect goes partly through large perturbations that occur rarely, or over limited areas (shiptracks, closing of open cells; ), and small perturbations that occur frequently, posing challenges for observability. For example,  indicate that shiptracks, the most eminently observable manifestation of ACI, exert a paltry 0.5 mW m−2 of forcing globally. The challenge is therefore to determine the meteorological conditions under which aerosol perturbations manifest as energetically significant, along with their geographical coverage and frequency of occurrence. The second set of scales is spatiotemporal: the scales relevant for ACI range from the microscale through cloud-process scales for cloud-top turbulent entrainment and cloud updrafts. However, the aerosol perturbations at cloud-scale affect the regional and global circulation, and these regional- through global scale changes feed back as meteorological influences on cloud processes [112, 133, 150, 151]. This means that constraining ERFaci requires understanding the microscale, the cloud process scale, and the global scale, as well as the interactions between scales. with a median value of − 1.38 W m−2 for GCM studies; ). Gryspeerdt et al. show that the choice of N a proxy can significantly reduce the discrepancy; their best estimate of RFaci based on a GCM-observation combination is −0.4 W m−2. Christensen et al. and Neubauer et al. take a different approach, investigating the effects of reducing near-cloud biases in satellite aerosol observations consistently between observations and modeling. This simplification of ACI, where the effect of clouds on aerosols is reduced, succeeds at bringing the GCM and observations into agreement and leads to a reduction in the intrinsic ERFaci to −0.28 ± 0.26 W m−2 from −0.49 ± 0.18 W m−2 when no removal of near-cloud aerosol observations is performed. However, the distant aerosol field can also be expected to have less causal connection with the aerosol that perturbed the cloud; the resulting forcing estimate should probably be considered an upper (i.e., least negative) bound. Thanks for those papers, they are very good and provide great news, if their constraints prove to be true, I remain somewhat skeptical of the overall results, knowing that the disentanglement of aerosol impacts on regional preciptitation, cloud height and reflectivity is very difficult to disengage and the larger effects of global atmospheric circulation patterns (and the potential for increased Relative Humidity) that would result from a complete removal of aerosols produces another massive amount of uncertainty. I am inherently more interested in their effects in convection-prone areas. From a meteorologist's perspective and anecdotal experience, they seem to have significant effects on deep convection (often as an enhancement -- especially in oceanic environments where boundary layer moisture restriction is less of an issue). Climate factors may considerably impact on natural aerosol emissions and atmospheric distributions. The interdependencies of processes within the aerosol-climate system may thus cause climate feedbacks that need to be understood. Recent findings on various major climate impacts on aerosol distributions are summarized in this review. While generally atmospheric aerosol distributions are influenced by changes in precipitation, atmospheric mixing, and ventilation due to circulation changes, emissions from natural aerosol sources strongly depend on climate factors like wind speed, temperature, and vegetation. Aerosol sources affected by climate are desert sources of mineral dust, marine aerosol sources, and vegetation sources of biomass burning aerosol and biogenic volatile organic gases that are precursors for secondary aerosol formation. Different climate impacts on aerosol distributions may offset each other. As anthropogenic aerosol emissions decrease, relative importance of Northern Oceans heat uptake increases. Important for Arctic Sea Ice, methinks? Ocean uptake of anthropogenic heat over the past 15 years has mostly occurred in the Southern Ocean, based on Argo float observations. This agrees with historical simulations from the Coupled Model Intercomparison Project phase 5 (CMIP5), where the Southern Ocean (south of 30±S) accounts for 72%±28% of global heat uptake, while the contribution from the North Atlantic north of 30±N is only 6%. Aerosols preferentially cool the Northern Hemisphere, and the effect on surface heat flux over the subpolar North Atlantic opposes the greenhouse gas (GHG) effect in nearly equal magnitude. This heat uptake compensation is associated with weakening (strengthening) of the Atlantic Meridional Overturning Circulation (AMOC) in response to GHG (aerosol) radiative forcing. Aerosols are projected to decline in the near future, reinforcing the greenhouse effect on the North Atlantic heat uptake. As a result, the Southern Ocean, which will continue to take up anthropogenic heat largely through the mean upwelling of water from depth, will be joined by increased relative contribution from the North Atlantic due to substantial AMOC slowdown in the 21st century. In the RCP8.5 scenario, the percentage contribution to global uptake is projected to decrease to 48%±8% in the Southern Ocean and increase to 26%±6% in the northern North Atlantic. Despite the large uncertainty in the magnitude of projected aerosol forcing, our results suggest that anthropogenic aerosols, given their geographic distributions and temporal trajectories, strongly influence the high latitude ocean heat uptake and interhemispheric asymmetry through AMOC change. We looked at the results of Durack et. al. (2014) here. The results of the paper in ASLR's post above (Aerosol impact in the NH OHC) was discussed at that time. 3. The basic model of understanding appears to be severely underestimating northern hemisphere aerosol effects. When we burn coal, the aerosol effect is pretty immediate and then stabilizes due to the low transit time of the aerosols in the atmosphere. The CO2 effect is cumulative, given the long transit time of CO2 in the atmosphere. Therefore, even if we just stabilize the level of coal burning then rate of climate change should increase (no increases in aerosols to offset the cumulative increases in CO2). The impact of aerosol (SO2) scrubbers is even worse, as we continue with CO2 but greatly reduce the aerosols. If China goes this way to clean up their air we will rapidly find out how much climate dimming is produced by aerosols. Probably not a good outcome for global climate change, nor for regional weather patterns. With the new maritime SO2 emission standards, this is already being put into practice for maritime traffic globally. Overall, everything (increasing CO2 emissions, fugitive methane, SO2 reductions) seems to be pointing to an acceleration in climate change. Add another El Nino and the next decade could become the "climate shock" decade. Neven is in danger of becoming (in)famous. I plonked this into the comments thing of the article as the link was just to Neven.typepad. The link in the article is to Neven's blog. The mass of data and comment on all things environmental are to be found on https://forum.arctic-sea-ice.net/index.php "The Arctic Sea Ice Forum" founded by Neven and open to all. So how much of an effect do aerosols have? It turns out 23% of the warming caused by greenhouse gases was offset by the cooling from aerosols. I admit that I know very little about aerosols, and have not been following the literature about it. So it may very well be that the better informed people on this fine forum find all of the following rather boring. But for me, it was pretty exciting and educative. What I really wanted to know was how they determined that aerosols had a significant impact on Arctic Sea Ice decline. Overall, I find the paper extremely thorough, and well argued. I especially like their careful and formal handling of uncertainty in the data, and I learned a lot just reading the methods they use. where SIEnat is the CMIP5 simulation of SIE (Sea Ice Exent) with Natural forcings only, SIEghg is the CMIP5 simulation of SIE with well mixed GHGs only, and SIEoant is the CMIP5 simulation of SIE with "everything else" (which is mostly aerosols). In CMIP5, there is no "OANT" simulation, so they use OANT = ALL - GHG - NAT. Which makes sense. Just remember that OANT is basically "everything else" that is not GHG or Natural driven. That's mostly aerosols, but not exclusively. SIEobs is the observed Arctic Sea Ice extent in September. and a new dataset by Piron and Pasalodos (PP) which I did not know about before and will certainly take a look at, especially since they date back to 1933. PP and WC are apparently very similar for the 1953-2012 period that Mueller et al used. The β's are scaling factors. If a β factor is close to unity (1), that suggests that the simulation is very consistent with the actual observed SIE. If a β factor is much different from 1, there may be something fishy going on. For example, if a β factor is close to 0, the signal is not detected at all. That would mean the simulated signal is not detectable in real live observations. If the β factor is much bigger than 1, there may be more causes for the signal in the observed data set than the simulations suggest. Now just keep that in mind for a moment, because I will get back to that. In my opinion, the real impressive part (the awe factor) in this paper is the way in which they deal with uncertainties. They have truly set up a Detection and Attribution mechanism, where the calculate formally how the uncertainties in the estimations propagate through the system. And there are many uncertainties to deal with : uncertainties in the GHG / aerosol / NAT forcings, uncertainties in the modeling of their effect on Arctic SIE, the uncertainties in the SIE record etc etc. When they apply these methods, the signals for GHG increases, Natural forcing and OANT (mostly aerosols) clearly are present in all 3 SIE data sets. They all come out of the noise, with a 90% certainty. That's impressive. So overall, I really like this paper. The only question I have is regarding the β factor they obtain for OANT (everything else but GHG and NAT forcings). I attached the results, from Figure 3.3 in the paper. This suggests that the OANT signal has a β factor of about 1.7 or 1.8. That means that the OANT (aerosols mostly) signal shows up 1.7 to 1.8 stronger in the actual SIE record than the simulations suggest. So either aerosols have a much stronger effect on SIE than simulations suggest, or there is another signal present in reality (maybe something like land snow-cover or so) which is similar to the aerosol, which is there in reality, but is not properly taken into account by the GCM CMIP5 simulations. Also, I don't see the 23% number from the Guardian anywhere in the paper. I suspect that the difference (23% versus 30%) is caused by the fact that aerosols do not fully cover the OANT (everything except for GHG and NATural) forcings. So, overall a great paper, with the notion that maybe they overestimated the influence of aerosols on Arctic Sea Ice extent by a factor of 1.7 - 1.8. Glad to see that our data are useful! Observations of incoming solar radiation, as measured at approximately 1400 surface stations worldwide, show a strong downward trend from the 1960s to the 1980s, followed by a weaker trend reversal thereafter. These trends are thought to be due to changes in the amount of aerosol particles in the atmosphere, and we find support for that here in the temporal evolution of anthropogenic aerosol emissions. This is expected because aerosol particles reflect and/or absorb sunlight back to space, and have a net cooling effect on Earth's climate. However, we find that the current generation of climate models simulate negligible solar radiation trends over the last half‐century, suggesting that they have underestimated the cooling effect that aerosol particles have had on climate in recent decades. Despite this, climate models tend to reproduce surface air temperature over the time period in question reasonably well. This, in turn, suggests that the models are not sensitive enough to increasing greenhouse gas concentrations in the atmosphere, with important implications for their ability to simulate future climate." I did not realize that. That is so cool diablo ! Congratulations ! 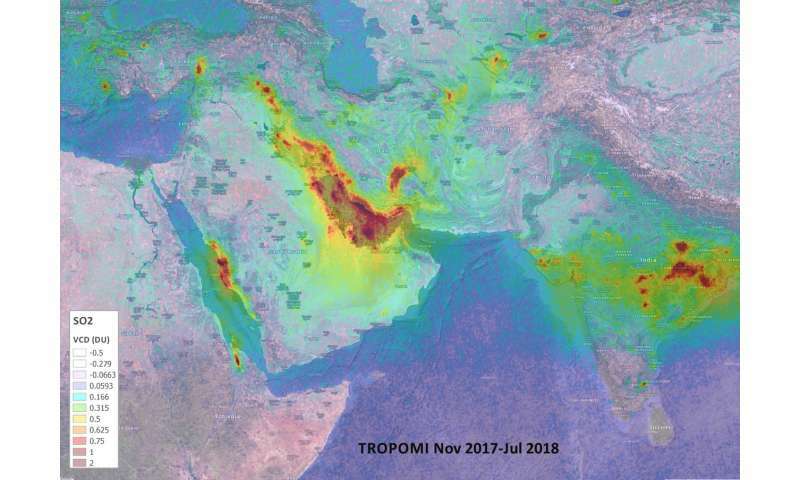 Nicolas Theys from the Royal Belgian Institute for Space Aeronomy said, "Copernicus Sentinel-5P's near-realtime data on sulphur dioxide and aerosols are being used in the Support to Aviation Control Service and in the European Natural Disaster Coordination Information System for Aviation. "The unprecedented level of details offered by the mission allows Volcanic Ash Advisory Centre users to better track and forecast the dispersion of volcanic plumes." Carbon tetrachloride (CCl4) is an ozone‐depleting substance, accounting for about 10% of the chlorine in the troposphere. Under the terms of the Montreal Protocol, its production for dispersive uses was banned from 2010. In this work we show that, despite the controls on production being introduced, CCl4 emissions from the eastern part of China did not decline between 2009 and 2016. This finding is in contrast to a recent bottom‐up estimate, which predicted a significant decrease in emissions after the introduction of production controls. We find eastern Asian emissions of CCl4 to be 16 (9–24) Gg/year on average between 2009 and 2016, with the primary source regions being in eastern China. The spatial distribution of emissions that we derive suggests that the source distribution of CCl4 in China changed during the 8‐year study period, indicating a new source or sources of emissions from China's Shandong province after 2012. Carbon tetrachloride is one of several man‐made gases that contribute to the depletion of the ozone layer high in the atmosphere. Because of this, restrictions were introduced on the use of this ozone‐depleting substance, with the expectation that production should by now be close to 0. However, the slower than expected rate of decline of carbon tetrachloride in the atmosphere shows this is not the case, and a large portion of global emissions are unaccounted for. In this study we use atmospheric measurements of carbon tetrachloride from a site in East Asia to identify the magnitude and location of emissions from this region between 2009 and 2016. We find that there are significant ongoing emissions from eastern China and that these account for a large part of the missing emissions from global estimates. The presence of continued sources of this important ozone‐depleting substance indicates that more could be done to speed up the recovery of the ozone layer. Compare the AR5 value of Faero of -0.9 W/m^2 with Mauritsen & Pincus 2017 display of current locked in warming based on Transient Climate Response (only through 2100) as derived from the fact that aerosol forcing has been suppressing warming. I'm trying to make sense of the graph you posted. Is the locked in warming in addition to the warming that's already occurred? Does it assume that aerosols go to zero during this century? What is the "with carbon uptake" scenario? No it is total warming from Pre-industrial by 2100 (See definition of Transient Climate Response), I am not sure now if it means zero aerosol emissions at 2100. I used to think that it did but now I fear that the models are being tweaked in every way possible to project less warming than should be expected. The range of aerosol cooling effects within the paper is well within the projected uncertainty of the study. Remember, the models include uncertainty in their projected ranges, though they usually only show the median values of projections. I'd describe myself as an activist. Rarely successful but I keep trying. Climate change is clearly most important but on this I am a voice amongst many but I try to pass on what I discover to like minds and to decision makers (politicians & related) that I seek out. The principal implication of our present analysis probably relates to the Faustian bargain. Increased short-term masking of greenhouse gas warming by fossil fuel particulate and nitrogen pollution represents a 'doubling down' of the Faustian bargain, an increase in the stakes. The more we allow the Faustian debt to build, the more unmanageable the eventual consequences will be. Yet globally there are plans to build more than 1000 coal-fired power plants (Yang and Cui 2012) and plans to develop some of the dirtiest oil sources on the planet (EIA 2011). These plans should be vigorously resisted. We are already in a deep hole—it is time to stop digging. A report in Science Daily says of Rosenfeld et al. Question 1: Does this mean that Hansen's Faustian bargain has just got much worse. Question 2: Why has it taken 30 years to find this out? Question 3: Will any of this get through to policy makers? cars, planes, high buildings and beef&lamb for climate reasons - for many years now. An naturally have campaigned for renewable energy. I've been campaigning for trees and the use of wood. As far as I can see, this shows on road transport (mostly cars), household biofuel, animal husbandry (beef & lamb particularly?) warm the Earth early on but industry (inc cement and steel manufacture? ), biomass burning, agricultural waste burning and shipping have medium to long term cooling effects before warming starts. "From the point of view of the general public, there's been a level of anxiety that people feel recently about their carbon footprint when they go to airports," Unger said. "We should be feeling that way when we turn on our car ignitions." 1.Cars - very, very, bad from the start. 2.Beef & lamb - very bad from the start. 3.Fossil fuel power - very bad but we worry about losing the initial cooling. 4.High buildings - bad but the embodied CO2 comes from "industry" so some initial cooling. 5.Planes - not so bad but we worry about losing the initial cooling. 6. Trees - where can they be planted to avoid the aerosol warming effects? a reluctance to accept that stopping mass car ownership is a priority. There's nothing to back up this alarmism in the abstract of the Rosenfeld paper. (the paper is paywalled so I can't check that) Looks like a journalist misunderstanding what the implications are to me. All it says it that if models incorporate the findings without recalibrating the rest of their aerosol models, they'll get it badly wrong and that aerosols may have heating effects too. Point 6 is relevant to BECCS. The author said that the cloud effects of aerosols from his study, which is considered robust, produces a much greater cooling effect than currently understood and that there is likely an additional heating mechanism that makes the models still perform within the range. He hypthesized an additional heating mechanism from deeper clouds to do this. After reading the paper my take is that it does identify a significantly greater cooling effect from aerosols than currently assumed. To align this with the actual increase in global temperatures there must be a greater source of warming. If that warming is another side effect of aerosols it will diminish with the aerosols. If the source of the extra heating is not from aerosols (perhaps climate sensitivity much closer to Hansen's estimates) then the removal of aerosols will greatly accelerate global warming. There was an orbital aerosol polarimetry sensor attached to the GLORY satellite that would have been used to determine total cloud forcing parameters globally and the exact chemical makeup of these aerosols. However, even after a prior mission had failed due to fairing malfunction and the fairing release mechanism was replaced with the military preferred Taurus satellite delivery mechanism, the GLORY satellite suffered catastrophic failure due to fairing malfunction. Rosenfeld used recent satellite data as a patchwork from multiple sources to produce this result which is considered quite robust. No. If they have any interest at all they are latched into the IPCC 1.5SR report that states we have almost double the current level of emissions before we lock in 1.5C of warming (even though 2017 was 1.2C.